All of the 2017-18 Virginia women’s basketball games – home and away – are available locally on the radio on NewsRadio 1070 AM and 98.9 FM WINA. The game will also stream live online as an ACC Network Extra contest. The Cavaliers are trying to rebound after dropping a pair of games to ranked opponents, falling 77-41 to No. 4 Louisville (Feb. 1) and 77-62 at No. 12 Florida State on Thursday (Feb. 8). Sophomore center Felicia Aiyeotan (Lagos, Nigeria) had her sixth double-double of the season at Florida State, scoring a season-high 15 points with 13 rebounds, one board shy of matching her career high. Aiyeotan shot 70.0 percent, going 7-of-10 from the field. Aiyeotan had five offensive rebounds at FSU, scoring seven of Virginia’s 12 second-chance points. Aiyeotan leads the ACC in blocked shots per game (2.5) and is back in the top-10 for rebounding, tied for ninth with Chatrice White of Florida State at 7.5 per game. Sophomore guard Jocelyn Willoughby (East Orange, N.J.) had her third double-digit rebounding game in the last seven games, grabbing 10 boards at FSU with a career-high six offensive rebounds in the game. Willoughby has converted her last 24 free throw attempts, a streak reaching back to the fourth quarter of the Syracuse game (Dec. 31). She did not miss a free throw in the month of January. Sophomore guard Dominique Toussaint (Staten Island, N.Y.) dished out six assists at Florida State. She is 12th in the ACC in assists per game, averaging 3.8 per contest. Toussaint also scored 12 points at FSU with six rebounds, her highest rebounding total in an ACC contest in her career. Virginia leads the all-time series against the Hokies, 47-12, and is 22-4 in ACC contests. Virginia won the first meeting of the season, 61-52. The Cavaliers led by 15 points in the first half, but the Hokies came back to tie the game, 50-50, with 2:33 remaining. The Cavaliers closed out the game on an 11-2 run, including going 9-of-9 from the free throw line, to secure the victory. A half-point in the Commonwealth Clash is at stake in Sunday’s game. 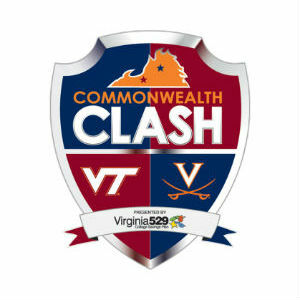 The Commonwealth Clash presented by Virginia529 is a head-to-head, points-based competition between the athletic teams at University of Virginia and Virginia Tech. The Commonwealth Clash encourages a friendly, statewide rivalry between the two schools across all school-sponsored sports with 21 individual event points on the line. The school that accumulates 11 points or more will be crowned the winner and take home the Virginia529 Commonwealth Clash trophy. Visit www.TheCommonwealthClash.com for more information and updated standings. The Cavaliers return home next week for their final two home games of the season, taking on No. 5 Notre Dame on Thursday, Feb. 15 at 7 p.m. and Miami on Sunday, Feb. 18 at 12:30 p.m.